Winner of the Edgar Bennett Helmet is…..
Heidi Rosby “voted” for Sarah Thomsen, WBAY Anchor, for Dancing with the Stars through her donation. All vote donations received 2/15 through 2/19 were entered into a drawing for a signed helmet from veteran Packer running back, and coach Edgar Bennett. 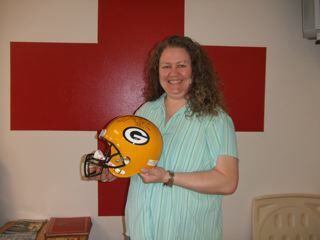 The helmet was given to the Red Cross courtesy of “Star Dancer” Mindy Bennett, Balance for Body and Soul, and Edgar Bennett. Thank you, Mindy and Edgar – and congratulations, Heidi! To view photos of the Dancing with the Stars event click HERE! MANITOWOC, WI – The American Red Cross serves communities around the block, across the country and around the globe everyday. Locally, our Board of Directors for the tri-county area has recommended two local Chapters consolidate to ensure the local identity and strengths of the existing Chapters are preserved. Therefore, on July 1, 2010, the Manitowoc/Calumet Chapter and the Sheboygan County Chapter will consolidate resources. In doing so, programs and services will not only be maintained, but strengthened as operating costs will be reduced. The new unified Chapter will be designed to help facilitate the sharing of responsibilities and resources. “What is most important is that the community can rely on our services 24/7 through shared services, reduced costs and that we are still, and always will be, a volunteer led organization,” stated Paul Callan, the Manitowoc/Calumet Chapter Board Chair. The two current boards have been strategically planning for several months and have determined that consolidation was the best course of action. A new Board of Directors will be formed by combining the two current volunteer boards. Their expanded role will ensure community support for all three counties and will have direct impact on the delivery of essential services. The joint board will partner with the Chapter Executive, Sherry Rezba, in developing and monitoring local strategies to deliver mission related services, fundraising, the Chapter budget and community outreach. This new structure allows the Red Cross quicker access to resources, particularly in times of disasters. The combined ability to respond as a newly formed Chapter now includes 258 trained volunteers. Collectively, disaster volunteers have responded to 21 local disasters (mostly residential fires) and several have been deployed nationally to support communities around the country. In addition, the Chapters have trained 9,000 community members in disaster preparedness. The current blood donation programs will be assessed as well. Last year, 4,727 units of blood were collected and each can save up to three lives. Collection sites and information about up-coming community blood drives will continue to be available at www.givelife.com. The 2032 Erie Avenue, Sheboygan location will be the administrative office and training facility, while the 205 N. 8th Street in Manitowoc office will serve as a service delivery and training location as well. In the past year, nearly 15,000 individuals were trained and certified, in life-saving skills such as people and pet First Aid, CPR, Automated External Defibrillator use, Water Safety and more. The Sheboygan Chapter was chartered in 1916 and the Manitowoc/Calumet Chapter in 1917. Both have a long history of meeting the needs of local families and communities. The Red Cross will continue to meet the needs of military families, disaster victims, hospital patients relying on blood donors, and those who turn to the Red Cross for lifesaving training. The decision to explore and ultimately take this route involved multiple elements, including a One Red Cross transformation as this national non-profit entity evolves. The Chapter will be positioned in the Northeast Wisconsin Region. This is important because the regional headquarters in Oshkosh provides new support functions which were not available even a few years ago. They include unified accounting, a central database, shared resources and many collaborative efforts designed to reduce costs, streamline programs and services all while maximizing volunteer and financial supporter contributions. The award “Man of the Year” started in 1951. In 1978, this award became “The Community Service Award” and recognizes an outstanding club, association, individual, or non-profit organization that has enhanced the quality of life for the community of Pulaski. Sue is involved with the Assumption of the Blessed Virgin Mary School and has served on many individual church committees with in her parish at Assumption BVM, is President of the Pulaski Ladies Auxiliary, shops and visits the elderly and shut-ins, coordinates calling blood donors for the American Red Cross blood drives held in Pulaski and many other activities. 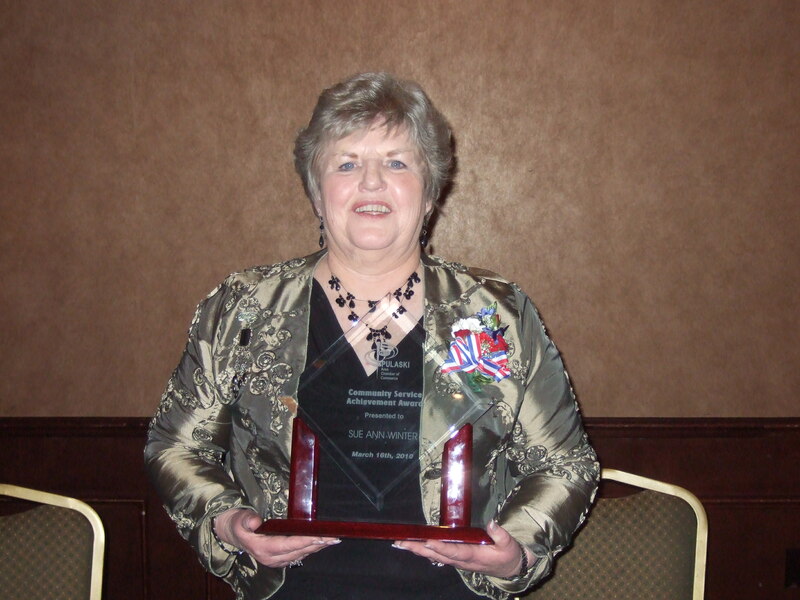 In her spare time she enjoys gardening, is a member of the Pulaski Red Hatters, and has participated and hosted many garden walks within the community and most of all enjoying quality family time with her four children and their families. UW-Green Bay Red Cross Club Awareness Concert! Join the UWGB Red Cross Club members and local musician, Rob Anthony, for an entertaining evening to bring awareness to the community on the impact the Red Cross has on our neighbors. Enjoy Rob’s inspiring and heartfelt music and listen to people share their life-saving Red Cross stories. At 9pm we will have a short intermission where some amazing people will share how the Red Cross has touched their lives! Join us for this FREE event. To see a sneak peak check out the VIDEO from WFRV TV-5 Sunday Morning Show were Tracy and Allie shared their story and views were treated to music by Rob Anthony! Hats Off to Each of the One Million Volunteers! Disney’s Give A Day Get A Day has Closed! We’ve reached our goal of inspiring one million people to volunteer a day of service to their communities, so the “Give a Day. Get a Disney Day.” program has now ended. Well, we knew it would happen, but didn’t expect it to happen this quickly! Disney’s Give a Day, Get a Disney Day program has officially closed. It has only been 2 months. One million people have volunteered (or signed up to volunteer) and received vouchers for a theme park ticket, a special fastpass, an EarHat figurine with exclusive trading pins, or the option to donate their park ticket to a participating charity. People from all over the world have gotten involved in volunteering. Disney has put a lot into this program, creating a new parade starring the Muppets, throwing a huge media event (Joe Jonas and Demi Lovato even sang!) 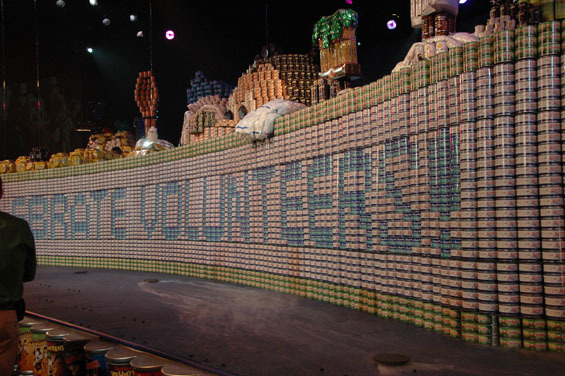 and breaking a world record with the largest sculpture of canned goods ever made. Even though the program is over, Disney is still encouraging guests to volunteer in their communities through the HandsOn Network. At the American Red Cross Lakeland Chapter we had 50 people give of their time to earn their ticket to Disney. Thank you to everyone who participated and keep volunteering!!! 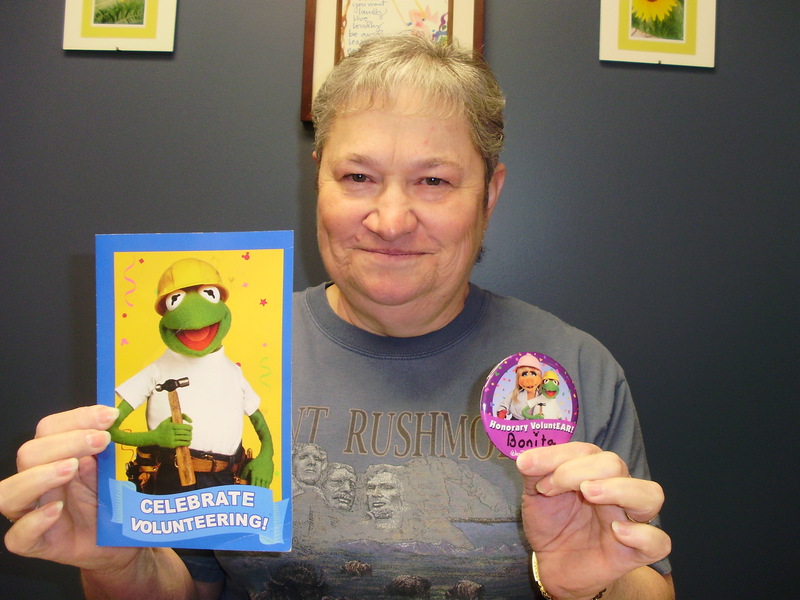 Bonnie Y., Red Cross Volunteer, with her button she got from Disney! The 34 students of Bayview Middle School’s 8th Grade Language Arts Class of Denise Gering, Crystal Cook and Emily Wells held a Rummage and Bake Sale on 3/20 and raised $386.00 for Haitian Relief! Everything at the Rummage Sale was priced at $2 or less. The students organized everything for their project. Washington Middle School, in Oconto Falls, presented a check for $700.00 for Haiti Relief to Jody Weyers, Volunteer and Communcations Director, American Red Cross Lakeland Chapter at their Career Day 2010.